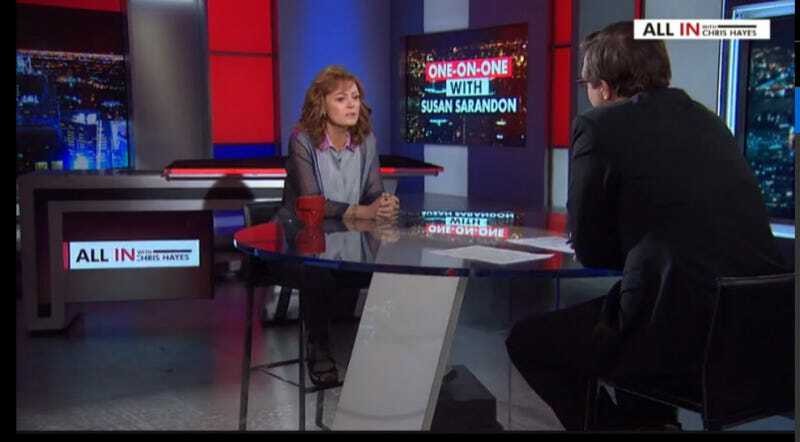 Susan Sarandon went on All in With Chris Hayes Monday night, where she opined that maybe it would be better to vote for malfunctioning wind turbine Donald Trump over Hillary Clinton, because he’ll usher in the revolution. This is a Bad Take, Susan Sarandon, and we’ve all been trying to get away from those. Sarandon, a vocal Bernie Sanders supporter who’s been campaigning for him, said she understood why many Sanders fans might have a hard time voting for Clinton if she takes the nomination. OK. We’re with you. Now let’s go to the part where the wheels fell off and the bus burst into flames. “You really think that?” Hayes asked. It’s truly inspiring that a wealthy white person is debating voting for Donald Trump, but for Woke reasons. Really something to consider.